They say London is one of the most exciting and diverse food capitals in the world. It seems whatever you might fancy, you are sure to find a spot in London that will both please your cravings and tickle your taste buds – including a rapidly growing Scandinavian foodie scene. As part of an ‘edible’ editorial series here on Scandinavialist, I have teamed up London-based Norwegian photographer Mariell Lind Hansen, and we will be taking you on a little tour of the very best of Scandinavian dining in London – First up is TEXTURE. Texture first opened its doors in Marylebone in 2007. With Icelandic chef Agnar Sverrison leading the team, previously head chef at Raymond Blanc's Le Manoir, it was one of the early settlers of Scandinavian dining in London. Agnar's approach to to fine-dining is relaxed with enticing influences from from his home country, Iceland. Just FIY, Iceland is one of the countries with the highest count of michelin-starred chefs per capita, so you know you're in good hands when you enter the the birch tree decorated entrance of Texture. As we enter, we are met by tall ceilings with immaculate original mouldings, panelled walls and large-scale windows in which floods the bar area with a beautiful moody light. The palette is muted and neutral, with the exception of the colourful explosion of lava art on the walls, again a reference to Agnar's origins. 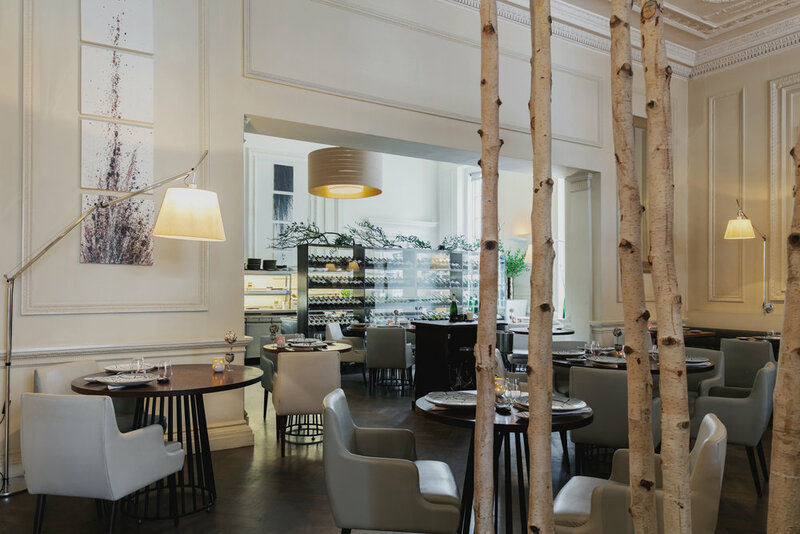 An array of tall birch trunks stretches towards the periodic ceiling creating an interesting contrast and a nice focal point as we enter the main dining room and greeted by the most welcoming staff. Also being a champagne bar, we start off with a glass of creamy bubbles before Mariell works her magic with the camera. Then for the highlight, the edible part of our visit. The menu in front of us is like music to the ears of a Scandinavian. With its Scandinavian influences and Agnar's specific attention to the quality and origin of the ingredients, a lot of it is sourced from Iceland directly, which makes the dining experience even more special. We are guided through the menu and recommended options suitable for both omnivores and pescatarians. And the serving begins. As the total bread-heads that we both are, the level of excitement is high as we are not only served a good portion of home-made breads, but also an array of well sculpted Scandinavian crips breads, topped with fried fish skin. Divine. Following the excitement and simple pleasure of the bread-session, each and every one of the dishes put in front of us looks like perfect little works of art, yet with that relaxed scandi-vibe. Agnar's concept of creating light and healthy food comes clearly across as we indulge further into the edible playful art in front of us. There is a profound complexity to it in terms of the skill set needed to cook both fish and meat to such perfection and texture is indeed a very well suited name for the restaurant. The carefully selected elements on the plate offers enticing combinations of flavour and texture but without overpowering the protagonist ingredient. The most intriguing dishes of our dining experience at Texture (apart from the bread-mania) was the pea mousse with mint snow and broad beans, Isle of Skye Scallops and the black Angus beef rib eye that was served on smoking coal. Oh and not to forget the freshly baked and still warm petite fours that surprising showed up after dessert..